Sever’s disease, known as calcaneal apophysitis, is the most common cause of heel pain in children. It’s a painful bone disorder created by inflammation of the growth plate in the heel, usually from muscle strain and repetitive stress. Sever’s Disease is very common in obese children and those who play lots of sports, and most commonly occurs during growth spurts in adolescence. For girls, this is usually between 8 and 13 years of age, and for boys, between 10 and 15. The heel is especially susceptible to injury in children. The foot is one of the first parts of the body to grow to full size and the heel area is not very flexible. The growth plate is a soft area at the end of the heel bone where cartilage cells change into bone cells, and it eventually fuses with the heel bone. During the early part of puberty, the heel bone sometimes grows faster than the leg muscles and the Achilles tendon, which attaches the calf to the heel bone. When this unequal growth occurs, the muscles and tendons become very tight, which makes the heel less flexible, placing a lot of stress on the growth plate. The Achilles tendon, when stretched too tightly, becomes swollen, tender, and painful where it attaches to the growth plate. This injury, a result of repetitive stress on the Achilles tendon, is Sever’s Disease. Pain or tenderness in one or both heels. Pain is usually felt at the back of the heel, but may also be felt along the sides and bottom of the heel, all the way to the arch. Sever’s Disease fortunately is a temporary condition. With proper care and treatment, symptoms will usually go away within 2-8 weeks, and it will have no long term consequences. If the condition recurs due to the child having a pronated foot, or a flat or high arch, your podiatrist may recommend custom orthotics to position the foot correctly inside the shoe and reduce stress on the heel. The risk of recurrence of Sever’s Disease diminishes with age, and as a rule won’t occur after the age of 15. By that time, foot growth is complete and the growth plate has fused to the rest of the heel bone. Back in April Pujols, 33, said of his plantar fasciitis, “I’m dying. It’s hurting real bad.” He was considering off season surgery, and he sort of got his wish Friday night when he tore the ligament, achieving a similar result. In plantar fascia surgery, a podiatric surgeon cuts part of the plantar fascia ligament to release tension and relieve inflammation. The surrounding soft tissue attaches to the plantar fascia and helps it heal. Unfortunately for Pujols, he didn’t suffer a complete tear, so off-season surgery may still be an option. 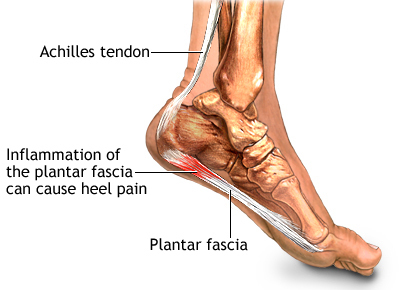 The minimum recovery period for a plantar fascia tear is six weeks, but with the Angels all but out of playoff contention and a season-high 13 games behind Oakland in the American League West, there is no need to bring Pujols back for the final two weeks of the season. Instead of having surgery in October and spending most of the winter rehabbing, Pujols can spend the rest of the summer recovering and come back healthy in 2014. Just goes to show what we always say – don’t play through the pain, because it will always get worse, sometimes seriously. It’s remarkable that even with the Angels’ state of the art sports medicine, highly paid trainers, and months to rest in every off season, Pujols’ plantar fasciitis never sufficiently healed. It’s a particularly difficult injury to treat in some cases. Even if you’re an amateur athlete – especially you marathon runners – you may easily be exposing your feet to the same pounding an MLB player like Pujols does. Any sign of pain – toes, heel, arch, or ankle – needs to be addressed immediately and given time to properly heal. Being out of the game temporarily, even for a full season, is much better than aggravating a minor condition into a serious injury which can sideline you for much longer. Heel pain affects nearly everyone at one time or another. Sedentary or active, man or woman, overweight or desired weight, heel pain is not discriminating. If you’re not an athlete subjecting your feet to extraordinary stress, then your heel pain is most likely due to one or a combination of factors: carrying too many pounds on your frame; having a job which requires long periods on your feet; faulty biomechanics of your foot; flat feet; high arches; dress shoes or athletic shoes which don’t support and cushion your feet correctly; or overuse, such as doing too much too soon in a new exercise program, or not warming up your legs before exercising. The Achilles tendon is the largest tendon in our body, connecting the heel to the calf. Whenever you jump, walk, or run, your Achilles is hard at work. Because it’s used constantly, it’s also the tendon in your body most likely to be injured. The pain from achilles tendinitis or a rupture of the tendon is felt anywhere in the area behind your ankle. Read more about achilles tendon injuries. Also known as “pump bump”, this form of heel pain is fairly obvious, as a small bump becomes red and sore on the back of your heel, right about where the hard backs of shoes rub, hence it’s nickname. Read more about Haglund’s deformity. A bone spur is a bony growth that forms along the edge of a bone in response to wear and tear. When it appears in the heel, it causes heel pain by rubbing on the achilles tendon or other soft tissues. Read more about heel spurs here. Other, less frequent causes of heel pain are bursitis, stress fractures, and tarsal tunnel syndrome. To learn more about heel pain, order our free download, The End Of Heel Pain.